Welding of precipitation hardening Ni-based superalloys is of significant importance in the aerospace industry . The devel - opment of aero engines has been closely linked to the development of high temperature performance alloys such as Waspaloy® and Haynes® 282®  . In the alloy design, mechanical properties must be balanced with other properties such as weldability for successful application of the alloy. The point where alloy performance and weldability coincide depends on the actual application of interest and the manufacturing methods that are available to produce that specific part. Nevertheless, in design and manufacturing of large and advanced load bearing structures it is of crucial importance that the alloys are weldable to avoid significant cost redundancies. The aim of this study is therefore to investigate the susceptibility to hot cracking of wrought Haynes® 282® and Waspaloy®, using the Varestraint weldability testing method. Haynes® 282® is a newly developed alloy with limited amount of information available regarding the weldability in the literature . Similarly for Waspaloy®, there is a lack of systematic weldability testing us - ing Varestraint testing method or similar techniques  despite the many years that the alloy has been around. This study will fill the missing knowledge gap of the materials and welding community in terms of a systematic focused study on hot cracking that aids the understanding of the hot cracking behavior of these two very important and promising superalloys. The name superalloy descents from the fact that these alloys possess “high-performance” properties at elevated tempera-tures. Waspaloy® and Haynes® 282® (chemical compositions tabulated in Table 1) investigated in the present study are both gamma prime (γ’) hardening Ni-based superalloys with postulated service temperature capability of ~700°C  and ~800°C , respectively. The γ’ phase has a L12 face-centered cubic (FCC) crystal structure with a stoichiometric structure of Ni3Al,Ti . So, an increase in the amounts of Al and/or Ti will increase the amount of γ’ phase which has a well-known adverse effect on weldability, or more specifically, increased susceptibility towards strain age cracking. A few other phases found in these two alloys are also of interest, namely MC and M23C6 carbides [6,7]. Table 1. Chemical composition (wt. %) of Waspaloy® and Haynes® 282®. The Varestraint testing method used in this study was originally developed in the 1960s  and is built on the principle that the area around the weld is strained during the actual welding. By varying the level of augmented strain, which is also the reason for the name of this method (VAriable RESTRAINT), the susceptibility to hot cracking can be evaluated [9-12] . As with all bending operations, both tensile strain (upper half of the test plate) as well as compressive strain (lower half of the test plate) will occur. There has been a common misunderstanding that the presence of the compressive strain influences the amount of cracks on the top surface in Varestraint testing, and hence only thicker testing plates than ~10 mm are recommended. However, a recent study clearly reveals that no effect of the compressive strains on the hot cracking susceptibility on the top surface of the testing plate can be observed . Initial microstructure of Waspaloy® and Haynes® 282® can be seen in Figure 1a and 1b, respectively. Waspaloy® was solution heat treated at 1010°C for 2 h followed by forced air cooling providing a macro-Vickers hardness of 294HV, Figure 1a, and a grain size of ASTM 4 (90 μm), while Haynes® 282® was used in the mill-annealed condition followed by polymer quench providing a macro-Vickers hardness of 203HV, Figure 1b, and a grain size of ASTM 5 (64 μm). The macro-Vickers hardness testing on the asreceived and as solution heat treated materials was carried out using 10 kg load for 12 s and taken as an average of 10 indents. The micro-Vickers hardness showed similar values, 208HV for Haynes® 282®, but somewhat higher 340HV for Waspaloy®. The micro-Vickers testing was performed on etched surfaces to avoid influence of micro-constituents such as carbides or grain boundaries and an average of 5 indents was taken. Grain size measurements were carried out using the linear intercept procedure in accordance to ASTM E112 . Microstructural preparation was performed according to standard metallographic procedures. Kalling’s etchant for Ni-based materials as well as electrolytic etching with oxalic acid were used to reveal the microstructure. Figure 1: Microstructure of as-received Waspaloy® (a) and Haynes® 282® (b) prior to Varestraint testing. The chemical composition (wt. %) of the test materials can be seen in Table 1, where the main differences are between the alloying elements of Mo, Fe, and Ti, but also the amount of P and B can be of great importance, especially connected to welding. The Varestraint testing was performed on plates with a thickness of 3.2 mm and using the set-up shown in Figure 2. The samples were prepared using support plates tack welded on the bottom side of the test sample in order to invoke bending that conforms to the radius, prevents hinging of the plate and only induces tensile strains in the test sample. The use of tack-welded support plates to prevent any compressive straining in the test plates was carried out before the results of the previous study were known , which disclosed that this action was not needed. The welding process used in Varestraint testing was gas tungsten arc welding (GTAW) equipped with an automatic voltage control unit which adjusts the electrode to work piece distance. The welding current was set to 85 A together with the welding speed of 2 mm/s and Ar-gas flow rate (18 l/min) for protection. The radii used were 50, 75, 100, 133, 200 and 400 mm imposing ideal augmented strains ranging from 1.1 to 8.6 % (three repetitions were made at each strain level) according to equation (1) below. The stroke rate was set to 16 mm/s. Figure 2: The Varestraint testing equipment at Aalto University showing the testing set-up and a completed test. After Varestraint testing, the amount of cracking was evaluated through several steps to minimize the measurement error. First, dye penetrant was applied to make it easier to disclose the cracks and photos were taken at approximately 0.5-10 s after wiping off the excessive dye penetrant. Finally, the total crack length was measured after calibration with the software called NIS elements®. The actual cracks were measured by 2-points per crack method, that is, only the linear distance between one point at each end of the crack were considered. This means that no consideration concerning crack deflection was made, since it was assumed negligible, i.e., the cracks appeared straight without any deflections. The total crack length (TCL) in mm versus the augmented strain (%) is presented in Figure 3. Waspaloy® possesses significantly higher hot cracking susceptibility at all strain levels in comparison to that of Haynes® 282®. The difference between the two alloys in terms of TCL is in the range of 10 mm at most strain levels together with the standard deviation of less than 5 mm which supports an advantage for Haynes® 282® in this case. 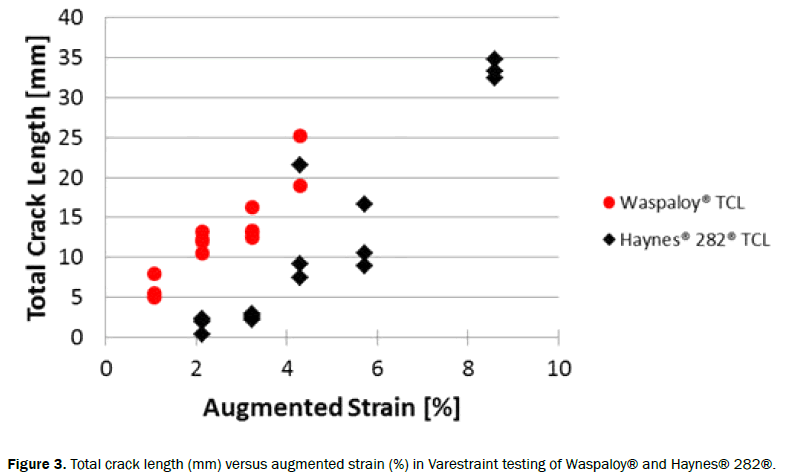 Figure 3: Total crack length (mm) versus augmented strain (%) in Varestraint testing of Waspaloy® and Haynes® 282®. It was not possible to complete the comparison at the highest strain level due to the limitation of the available test material. However, both materials constituted the same amount of test plates (11 test plates) in the range from 1 to 6 % augmented strain and the additional test plates above 6 % give information about the saturation level. The crack patterns were similar for both Waspaloy® and Haynes® 282® as shown in Figure 4. The difference in the aug-mented strain level, 3.2% versus 8.6%, respectively, influences the heat transfer leading to different weld bead sizes is to be noted. Irrespective of the strain level, the cracks are located both in the heat affected zone (HAZ) and in the weld fusion zone (FZ). By examining the cross-sections as well as the top surface microstructure photos, micro-fissuring or HAZ liquation cracking and solidification cracking can be clearly seen. In general, the number of cracks and the length of the cracks is shorter for Haynes® 282® as compared to Waspaloy® at the equal strain levels. 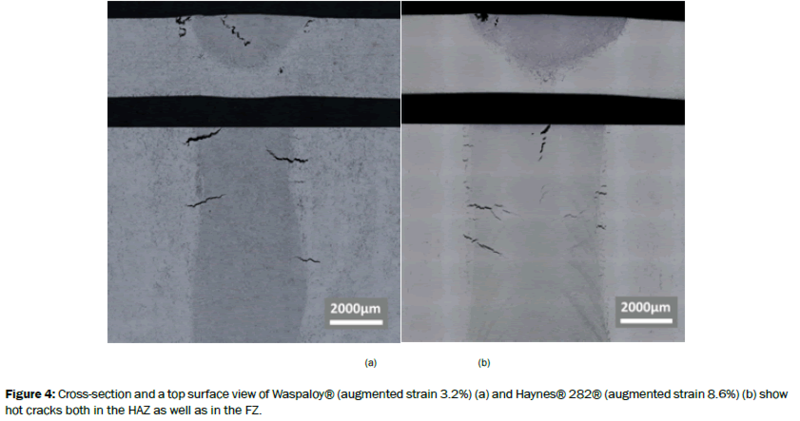 Figure 4: Cross-section and a top surface view of Waspaloy® (augmented strain 3.2%) (a) and Haynes® 282® (augmented strain 8.6%) (b) show hot cracks both in the HAZ as well as in the FZ. The actual welds are approximately 1 mm wider for Haynes® 282® than for Waspaloy® as seen in the cross-sections in Figure 4 which is due to the different heat transfer imposed by the different radii (difference in contact length between the test plate and the radius). Also on the root side, the Waspaloy® plate is more deformed and the shape of the weld pool is more circular. However, other sections of the plates tested with the same radius showed an equal width as well as same shape. In a small region outside the fusion zone near the tip of a HAZ liquation crack in a Haynes® 282® sample, a secondary phase can be observed, as seen in Figure 5a and 5b. The crack is relatively small and extends almost to, but not into the weld fusion zone, which means that there is not enough liquid network to support backfilling. The secondary phase, possibly forms on a grain boundary and is divided into several small segments which can act as a possible crack path if positioned close enough to each other. A brighter area surrounds the secondary phase and similar regions were observed in the fusion zone. Also, an area close to the crack shows evidences of partially dissolved carbides. Figure 5: HAZ liquation cracks with a secondary phase in a Haynes® 282® sample (a) together with a closer view (b) where the bright segregated areas surrounding the secondary phase near the crack tip are present. The micro-Vickers hardness tests were carried out using a 200 g load, and revealed that an overall hardness was generally 100HV higher for Waspaloy® as seen in Figure 6. A similar hardness level of roughly ~250HV is reached for both alloys in the FZ. When comparing the hardness of the centerline in the FZ with that of each base metal, FZ of Waspaloy® has lower hardness than that of the base metal, while FZ of Haynes® 282® has a higher hardness than the base metal. Figure 6: Micro-Vickers hardness measurements carried out across a weld cross-section of Waspaloy® and Haynes® 282®, respectively. The Waspaloy® weld cross-section insert is for explanation. When comparing the hot cracking susceptibility between Waspaloy® and Haynes® 282® as evaluated in this study, the results from other investigations [14,15] on Gleeble hot ductility testing are considered. Both the present investigation as well as the previous studies on hot ductility support the conclusion that Haynes® 282® possesses a lower susceptibility to hot cracking due to the narrower Brittle Temperature Range (BTR) as well as a lower amount of total cracking as demonstrated by Varestraint testing. Other main parameters affecting the hot cracking susceptibility are: grain size, hardness and the amount of trace elements (S, B, and P). The results from Varestraint tests clearly show that Haynes® 282® has a lower hot cracking susceptibility than that of Waspaloy ®. Approximately a 10 mm difference in TCL at all augmented strain levels up to 4.3% was observed between Waspaloy® and Haynes® 282®. Interestingly, strains above 4.3% for Haynes® 282® do not show any tendency for TCL saturation, which suggests that the needed strain level for TCL saturation is above 8.6%. By considering the Varestraint testing data on the as-received Waspaloy®, which were obtained in the previous study (using the same testing parameters) and plotting them together with the results from this study in Figure 7, it can be seen that the solution heat treatment for 2 h at 1010°C has a very limited effect on the hot cracking susceptibility of Waspaloy®. As seen in the figure, most of the data points for the as-received Waspaloy® material coincide and match an assumed linear extrapolation of cracking results towards higher strain levels for the solution heat treated condition excluding the two data points at the strain level of ~4.5%. The as-received Waspaloy® material came from the same batch of material as the one tested in this study and therefore has the same chemical composition. However, the grain size was ASTM 5.7 (~53 μm) with a macro-Vickers hardness of 238HV which further suggests that neither the specific difference in grain size nor the hardness have any significant influence on the effect of susceptibility to hot cracking. This further supports the advantage of Haynes® 282® in the comparison. 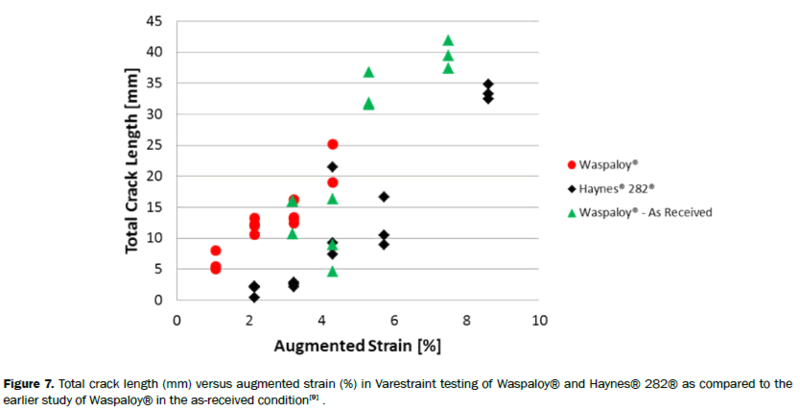 Figure 7: Total crack length (mm) versus augmented strain (%) in Varestraint testing of Waspaloy® and Haynes® 282® as compared to the earlier study of Waspaloy® in the as-received condition . At reduced levels of augmented strain extrapolation to lower strain levels for Waspaloy® leads to zero, while Haynes® 282® seems to be able to sustain a certain level of strain without any hot cracking. However, to validate this, a more detailed study at lower levels of augmented strain is required. The microstructural analyses of the HAZ reveled possible evidence of a secondary phase distributed ahead of the propagating cracks in the Haynes® 282® samples. This secondary phase can be the same as distributed interdendritically in the FZ identified in other studies [5-16]] as Ti-Mo based MC-type carbides with an FCC crystal structure. MC carbides were found randomly distributed intergranularly and intragranularly within γ phase with typical size in the range of 2-15 μm. Small angle diffraction pattern (SADP) technique has been utilized in  to detect Mo-B rich particles, which appeared to be M5B3-particles, at the grain boundaries as well as grain boundary triple points. The particles seem to be too small when compared with the secondary phase observed in this study. On the other hand the difference in the welding method and the distribution along grain boundaries can explain the appearance. Furthermore, the area around the secondary phase seems to be segregated which can be a prerequisite for the phase transformation. The cracks in both alloys seem to prefer the interdendritic paths in the FZ and along the segregated grain boundaries in the HAZ. For Waspaloy®, the visible area near the cracks does not show any traces of low melting phases, which suggests that a more advanced evaluation at a higher magnification is needed in order to confirm or exclude the presence of MC carbides observed in the earlier study . The Gleeble hot ductility test results disclosed a BTR of 187°C for Waspaloy®, which indicates that the alloy is more suscep-tible to HAZ cracking as compared to Haynes® 282®, which had a BTR of 110-125°C, respectively. The main explanation [15-] which relies on increasing sensitivity to hot cracking with wider BTR can be evaluated based on the difference between the peak temperature and the Ductility Recovering Temperature (DTR). Critics, however, suggests  that alloys with high tensile strength at elevated temperature may be cracking resistant despite of low ductility and alloys which possess relatively low tensile strength at elevated temperature, combined with only moderate ductility, are usually cracking sensitive. There are many different parameters which have to be considered when the welding performance is evaluated. In this study the weldability is referred to the ability of a material to avoid hot cracking in the FZ and HAZ. To support the initial conclusions there is a need for different types of metallurgical examinations to support the observations made after the testing, some of which have already been mentioned. Waspaloy® had a micro-Vickers hardness of 340HV in the base metal while Haynes® 282® had hardness of 208HV which can primarily be explained by the degree of γ’ precipitation hardening. The size, shape, and misfit of the precipitates can also be considered , since they influence the misfit dislocation density in the HAZ and thereby the susceptibility to HAZ cracking. Furthermore, the micro-Vickers tests showed a similar hardness of the weld metals of 250HV, while the base metal had a higher hardness level for Waspaloy® but lower hardness level for Haynes® 282®. The decrease in hardness can be explained by fast cooling and therefore by avoiding the precipitation of γ’, but the increase in hardness from base metal to weld metal is most probably related to the fact that the polymer quench performed after mill annealing is very fast, maybe even faster than the cooling directly after welding, at least within a certain temperature range (e.g., 900 to 500°C). The transition area with locally higher hardness in the HAZ can be explained by precipitation hardening of γ’ and/or by high degree of local plastic deformation. The overall level of hardness was generally higher for Waspaloy® except the similar level of hardness in the FZ, which may mean a higher degree of localized plastic deformation and cracking in the solidifying weld metal. The higher hardness of Waspaloy® leads generally to an increased hot cracking susceptibility, since it may be less capable of coping with the strains which are induced at testing or welding, but if compared to the as-received Waspaloy® material presented in Figure 7, the difference in hardness seems to be insignificant. The smaller grain size ASTM 5 (64 μm) of Haynes® 282® compared with ASTM 4 (90 μm) in Waspaloy® may be important for the weldability. In general, it is believed that the larger grains deteriorate the weldability [7,20-23], because the grain bound - ary area decreases and less strain can be accommodated. Also, the stress concentrations at the grain boundary triple points increase, which are likely crack initiation sites. Furthermore, a thicker liquid film in a coarse grain structure is generally associated with longer time of solidification upon cooling and therefore possesses a greater risk of cracking. Opposite results can be found  when considering different types of castings of Alloy 718. Considering the as-received Waspaloy® material which possessed the smallest grain size among the three different conditions (ASTM 5.7, 53 μm) it seems that the difference in grain size is insignificant within this specific range and boundary conditions used for testing. The sulfur content of the two alloys was equal and the amount of carbon was also comparable, i.e., 0.08 wt.% in Waspaloy® and 0.068 wt.% in Haynes® 282®. Therefore, differences of these elements are assumed to be less important. When considering the phosphorous content of 0.004 wt.% in Waspaloy®, which is double compared with that of Haynes® 282® and the boron content of 0.006 wt.% compared with 0.004 wt.%, respectively, the weldability is generally accepted to be worse for Waspaloy® [7,25-28]. The element segregation of melting point depressants like boron and phosphorous, can reduce the melting point of the grain boundaries. The need for the intergranular liquid to wet and spread along the grain boundaries is considered to be important and is usually presented as wettability, dihedral angle and interfacial energy. It is not known to what extent B or P influence these properties. On the other hand, boron and phosphorous are suggested to have synergetic effects improving the grain boundary cohesion at elevated temperatures significantly which gives strong reasons for including them. Backfilling, where a HAZ liquation crack is healed by liquid from the fusion zone, can be important when evaluating cracking of welds. Other effects can also be involved coming from segregation and interactions between dislocations/vacancies. However, a previous study on Haynes® 282® using, for example, TEM indicated that the susceptibility to liquation cracking may depend on constitutional liquation of borides (M5B3) in the temperature range of 1150-1170°C. The susceptibility to hot cracking is higher for Waspaloy® than for Haynes® 282® according to the Varestraint testing performed in this study which is further supported by the earlier Varestraint testing on as-received Waspaloy® and Gleeble hot ductility tests that disclosed a significantly larger BTR for Waspaloy® in the comparison. In Haynes® 282®, HAZ liquation cracking was connected to the presence of an intergranular secondary phase which seems to be similar to what was identified earlier in the FZ, namely Ti-Mo based MC-type FCC carbides. The weld metal hardness was similar (250HV) for both alloys, while in comparison with their respective base metal; Haynes® 282® revealed an increased weld metal hardness as compared to a decreased hardness level of Waspaloy® weld metal. Professor Olanrewaju Ojo of University of Manitoba in Canada is acknowledged for reviewing the paper. Andersson J. Weldability of Precipitation Hardening Superalloys – Influence of Microstructure, PhD thesis, Chalmers University of Technology, Cothenburg, Sweden, 2011. Kim TS and Hwang SH. Part load performance analysis of recuperated gas turbines considering engine configuration and operation strategy. Energy 2006; 31: 260-277. Pike LM. Development of a fabricable Gamma – Prime (γ') Strengthened Superalloy. Superalloys 2008 [edn] Reed RC, Green KA, Caron P, Gabb TP, Fahrmann MG, Huron ES, Woodard SA. The Minerals, Metals Mater Soc 2008; pp: 191-200. Sims CT, et al. Superalloys II, John Wiley & Sons 1987. Osoba LO. A study on laser weldability improvement of newly developed Haynes 282 superalloy. PhD thesis, University of Manitoba, Winnipeg, Canada 2012. Fayman YC.γ-γ′ partitioning behaviour in waspaloy. Mater SciEng 1986; 82: 203-215. Vishwakarma KA. Microstructural analysis of weld cracking in 718Plus superalloy, PhD thesis, University of Manitoba, Winnipeg, Canada 2007. Savage WF and Lundin CD. The varestraint test. Welding J 1965; 44: 433-442. Andersson J, et al. Hot Cracking of Allvac® 718PlusTM, Alloy 718 and Waspaloy at Varestraint testing. Proceedings of the 47th Conference of Metallurgists (COM), ed. byElboujdaini M, Winnipeg, Canada, August, 2008; pp: 401–413. Farrar JCM. Hot Cracking Tests – The Route to International Standardization. Hot Cracking Phenomena in Welds, ed. Böllinghaus T and Herold H. Springer-Verlag Berlin Heidelberg 2005; pp: 291-304. Cross CE and Coniglio N. Weld Solidification Cracking: Critical Conditions for Crack Initiation and Growth. Hot Cracking Phenomena in Welds II, ed. Böllinghaus T, Herold H, Cross CE and Lippold JC, Springer-Verlag Berlin Heidelberg 2008; pp: 39-58. Andersson J, et al. Improved understanding of Varestraint Testing - Nickel-based superalloys. Cracking Phenomena in Welds IV, Springer International Publishing, ed. by John Lippold, Thomas Böllinghausand Carl E Cross 2016; pp: 25-36. ASTM E112-13. Standard Test Methods for Determining Average Grain Size, ASTM International, West Conshohocken, PA, USA 2013. Andersson J, et al. Hot Ductility Study of Haynes® 282® Superalloy. Proceeding of The 7th International Symposium on Superalloy 718 and Derivatives, TMS (The Minerals, Metals and Materials Society), ed. by Ott EA, Groh JR, Banik A, Dempster I, Gabb TP, Helmink R, Liu X, Mitchell A, Sjöberg GP and Wusatowska-Sarnek A, October 2010; pp: 539-554. Andersson J, et al. Effect of Different Solution Heat Treatments on the Hot Ductility of Superalloys, Part 3 –Waspaloy. Mater Sci Tech 2013; 29: 43-53. Matysiak H, et al. Microstructure of Haynes® 282® Superalloy after Vacuum Induction Melting and Investment Casting of Thin-Walled Components. Mater2013; 6: 5016-5037. DuPont JN, et al. Welding Metallurgy and Weldability of Nickel-Base Alloys. John Wiley & Sons Inc., USA 2009; pp: 114. Campbell RD and Walsh DW. Weldability testing. ASM Handbook 1993; 2: 603. González Albarrán MA, et al. Effect of preweld heat treatment on the microstructure of heat-affected zone (HAZ) and weldability of Inconel 939 superalloy. J MaterEng performance 2014; 23: 1125-1130. Donachie MJ and Donachie SJ.Superalloys: Superalloys - A Technical Guide. ASM International2002. DuPont JN, et al. Welding Metallurgy and Weldability of Nickel-Base Alloys. John Wiley & Sons Inc., USA 2009; pp: 171. Cross CE. On the Origin of Weld Solidification cracking. Hot Cracking Phenomena in Welds, ed. Böllinghaus T, and Herold H, Springer-Verlag Berlin Heidelberg 2005; pp: 3-18. Yaman YM andKus MC. Hot cracking susceptibilities in the heat-affected zone of electron beam-welded inconel 718. JMaterSciLett 1998; 17: 1231-1234. Huang X, et al. Effect of grain size on the weldability of cast alloy 718. Mater Manufacturing Process 2004; 19: 285-311. DuPont JN, et al. Welding Metallurgy and Weldability of Nickel-Base Alloys. John Wiley & Sons Inc., USA 2009;pp: 295. Vishwakarma KR, et al. Microstructural analysis of fusion and heat affected zones in electron beam welded ALLVAC® 718PLUS™ superalloy. MaterSciEngA 2008; 480: 517-528. Vishwakarma KR andChaturvedi MC. Effect of boron and phosphorus on HAZ microfissuring of Allvac 718 Plus superalloy. MaterSciTech 2009; 25: 351-360. Richards NL. The effect of grain boundary segregation of boron in cast alloy 718 on HAZ microfissuring - A SIMS analysis.ActaMaterialia1997; 45: 3095-3107.